Huawei – currently the world’s third-biggest smartphone manufacturer, behind Apple and Samsung – will be hoping its latest devices will help to drive greater success and make the Chinese company’s name even more renowned. The P20 and P20 Pro follow on from the Mate 10 and Mate 10 Pro – both highly favoured devices for reviewers. Indeed, Android Authority named the latter its 2017 phone of the year. So the company has set itself a high bar and therefore has a lot to prove with its latest releases. It will prove exceptionally difficult to do that in the US, the third-largest smartphone market in the world, according to Canalys. This is because Huawei is currently unable to make a deal with any US networks to sell their devices in the country as the firm has been deemed a security risk due to its close ties to the Chinese government. At the beginning of 2018, a partnership with US carrier AT&T was on the cards for Huawei. However, at the Consumer Electronics Show 2018, chief executive of the company’s consumer business Richard Yu confirmed that this would not be happening because of political pressure. Retail partner Best Buy also dropped Huawei’s devices, leaving the firm with few options to get its devices into the US market. In addition, chairman of the Federal Communications Commission (FCC) Ajit Pai recently proposed cutting a government subsidy for any US telecom carrier that buys broadband kit from the Chinese company. Whether these issues will result in a change in the company’s actions in other markets remains to be seen. However, many expect Huawei to focus more on Europe, with CCS Insight’s Ben Wood telling BBC News that other manufacturers “should be seriously concerned that the threat it poses has just been dialled up a whole order of magnitude, as it's just released resources and money to resolve some of its brand issues". The main attraction of the P20 and P20 Pro are the cameras. The latter is the first device to offer three rear cameras – a 40MP primary camera, which is supported by a 20MP monochrome sensor and an 8MP telephoto lens. The P20 does not feature the triple-camera setup, but has a 12MP RGB and 20MP monochrome rear camera. In practical terms, what the P20 Pro offers is a way of taking photographs in the dark without having to use the flash. This is because it takes exposures that last up to six seconds, giving it enough light to capture the image. Huawei has also built artificial intelligence into its cameras, allowing users to take sharper photos and avoid blurring. 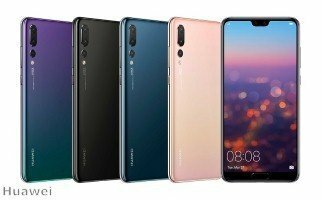 Internally, the P20 and P20 Pro share a Huawei Kirin 970 octa-core CPU, but the P20 comes with 4GB of RAM, while the P20 Pro gives users 6GB. Meanwhile, both come with 128GB of storage. In terms of battery power, the P20 offers 3,400mAh and the Pro 4,000mAh. Both phones feature Huawei’s SuperCharge, one of the world’s fastest charging systems. Bucking the trend for rear-mounted fingerprint scanners, both phones feature theirs on the front. They are situated just below the 5.8-inch and 6.1-inch displays. When it comes to the screens, it’s not just size that differentiates them. The P20 has a FullView IPS LCD 2244 x 1080 display, while the larger P20 Pro comes with a FullView OLED 2240 x 1080 screen. However, they both feature aspect ratios of 18.7:9. When Apple debuted its iPhone X, much of the industry’s attention was focused on the camera notch at the top of the display. It proved highly controversial, with many commentators and polls expressing the opinion that a thin bezel – in the style of Samsung’s Galaxy S8 and S9 – were preferable. However, it didn’t take long for some lesser known Android brands to mimic the design move and it has now surfaced on a device produced by a highly regarded firm. The P20 and P20 Pro both feature the notch, which houses a 24MP camera, with an f/2.0 aperture and fixed focus. The P20 is currently on sale for £599 in the UK, while the P20 Pro is priced at £849.